Atlantis The Palm Hotel Dubai is one of the most spectacular resorts in the world, taking 5-star luxury to a whole new level. This grand oceanfront hotel dominates Dubai’s famous skyline, and it’s just as dazzling on the inside as it is on the out. Located at the apex of the Palm Jumeirah, this luxury establishment is an oasis in the desert offering spectacular views of the glistening Arabian Gulf. Make a splash at the hotel’s the on-site waterpark, admire the rainbow-coloured aquarium, spend time in the two outdoor pools and indulge in the gorgeous beachfront - with scuba diving, wind surfing, kayaking, jet skis and a host of amazing watersports on your doorstep. 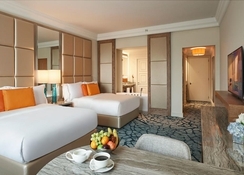 The rooms at Atlantis The Palm are a spectacle in itself, contemporary furnishings with a touch of Arabian glamour plus breathtaking views of the sea. Atlantis The Palm is a gastronomic delight, with 23 world-class restaurants serving delectable cuisine from award-winning chefs – Nobu, Bread Street Kitchen & Bar, Ossiano, and Seafire Steakhouse & bar to name a few. When you’re not fine dining, indulge in a pamper session at the ShuiQi Spa & Fitness centre, complete with underwater yoga classes, luxurious treatments, first-class fitness centre and a salon – all offering unimaginable heights of relaxation. 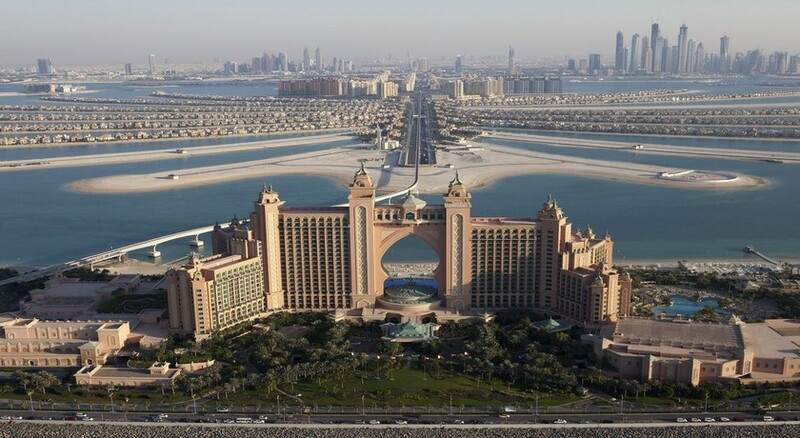 Atlantis The Palm Hotel Dubai is a hotel experience that should be on everyone's bucket list. 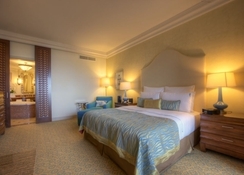 Atlantis The Palm Hotel Dubai enjoys an outstanding location, nestled in 46 acres of manicured gardens and surrounded by the Aquaventure Beach, Royal Beach and the Nasimi Beach Club. Being a short distance from a gorgeous sandy man-made beach, the hotel provides excellent opportunities for family oriented fun. It also offers stunning views of the Dubai skyline and is 25km from the iconic 160-story Burj Khalifa, the world's tallest building. Dubai International Airport is 36km from the hotel and is well served by private taxis. Atlantis The Palm Hotel Dubai has over 1,500 elegantly furnished rooms in 12 categories: Palm Beach Deluxe Guest Room, Deluxe Guest Room, Ocean Deluxe Guest Room, Imperial Club Room, Executive Club Suite, Regal Club Suite, Terrace Club Suite, Underwater Suites, Grand Atlantis Suite, Royal Bridge Suite and Presidential Suite. All rooms feature TV with satellite connection, mini bar, Wi-Fi internet, en suite bathroom with bath amenities, hairdryer and a telephone. Suites have a separate bed room, dining area, couches and sofa bed. The resort is an absolute paradise for gourmet dining. There are 23 restaurants for every taste under the sun, such as Asia Republic (Asian cuisine), The Burger Joint (fast food), The Edge Restaurant (poolside restaurant), Kaleidoscope Buffet Restaurant (international cuisine),Levantine Restaurant (Lebanese), La Brasserie Restaurant (French), Ossiano Restaurant (seafood), Nobu Restaurant (Japanese), Yuan Restaurant (Chinese), Seafire Steakhouse & Bar (grilled steaks) Ronda Locatelli (Italian), Nasimi Beach Restaurant (beachfront bar with international cuisine), Saffron Buffet Restaurant (Asian), Shawafel (shawarma and falafel menu), Barazura Cocktail (bar menu), Plato's Coffee & Tea Lounge (beverages menu), Poseidon (café menu) Outdoor Dining (international menu) and The Shore (poolside bar). Weekly theme dinner and parties are hosted. Special diet requests can be accommodated. 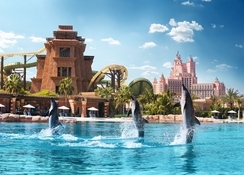 The Aquaventure Waterpark and the adjacent marine park are some of the best waterparks in the world. Free to guests staying at the hotel, you can explore the Lost Chambers Aquarium, marvel at over 65,000 marine animals at the Ambassador Lagoon, swim with dolphins, play with sea lions and take some of the best selfies possible on a holiday. This is also a great site for scuba-diving. Kids can join the mini club and join in with fun workshops and activities. For fitness fanatics there is a well-equipped, state-of-the-art gym. Alternatively, you can check into the ShuiQui spa for relaxing treatments and massages. Several pools with parasols, tennis court, chopper rides and animation programmes are other attractions of this hotel. And when the sun goes down, head to the on-site N'Dulge Nightclub which is adults only, and chill out under the dessert stars on the terrace, cocktail in hand. *** Reservation is mandatory in all the restaurants. *** Dress code in the restaurants is casual smart. *** Some restaurant timings are subjected to weather condition. Located in the East Wing of The Royal Towers, Kaleidoscope offers a family-friendly buffet dining experience. Food includes cuisines from Asia, India, the Levant and Europe. A mosaic pizza oven prepares fresh pizzas, as well as fresh pasta stations and traditional curry and tandoors. Kaleidoscope is available for Iftar during the month of Ramadan. Located in the West Wing of The Royal Towers, Saffron offers a contemporary interactive buffet with 20 theatrical cooking stations. The food has an accent on Asian specialties, such as a sushi and sashimi counter, an Indian section, a steam and poach kitchen, a South East Asian curry station, a large bread preparation section, a European station, a salad bar with a cheese humidor and new Korean section. Ayamna means ‘our memorable days’; a reference to the beautiful experiences of Lebanese culture, food and atmosphere. Enjoy a wide variety of delicate Lebanese dishes using the freshest and finest ingredients. The restaurant design is a modern interpretation of the tastes, flavors and traditions of Lebanon. Located on the beach in front of The West Tower, Nasimi has a relaxed beach side style seating. During the day, classic poolside cuisine is offered and guests on half board can enjoy a threecourse set menu. Dinner: 6:00pm – 10:00pm daily. Adjacent to the Royal Pool and in between The Royal Towers, guests on half board can enjoy a three-course set menu dinner at The Shore. Adjacent to the Royal Pool in between The Royal Towers, guests on half board can savour a three-course set menu dinner at The Edge. All TBJ burgers are freshly prepared using the finest quality of 100% pure beef complemented with our awesome TBJ sauce. Choose ‘The Works’ with the ultimate in toppings if looking to indulge, enjoy gloriously melted cheddar cheese with the ‘Cheesy’ or bring back fond memories with the traditional ‘Old School’ burger. Not into beef? Choose the succulent 'Rooster Booster' chicken fillet or the healthy option of the ‘Mighty Veggie’ burger. A casual dining experience offering an array of authentic Chinese, Vietnamese, Cantonese, Thai, Indonesian, Malaysian and modern Korean dishes. The diverse menu highlights Dim Sum, Appetizers, Noodle Soups, Wok-Fried Noodles, Chef’s Specials and Desserts. Dishes are designed for both sharing and individual portions. Fast and flavoursome with all the fun and originality of a street-side eatery, Shawafel is every sandwich lover’s dream destination. Their famed shawarmas and falafels are wrapped up in freshly baked warm saj bread and served alongside deliciously wholesome Laban milkshakes and classic Saj bread. This is one fast food joint you’ll never be in a hurry to leave! Celebrity Chef Giorgio Locatelli presents family style Italian cuisine from brick-oven pizzas as well as antipasti and delicious pastas. Located at the Shopping Avenues, enjoy sophisticated Italian trattoria-style cooking, using fresh ingredients sourced directly from Umbria, Italy. Mirroring the lively warehouse style of Celebrity Chef Gordon Ramsay's famous Bread Street Kitchen in London, this is the finest and most authentic gastropub in Dubai. Serving a delectable British European menu, well known classic beverages and some delicious cocktails, Bread Street Kitchen is an ideal choice for lunch, dinner or drinks till late. The award - winning steakhouse boasts exceptional cuts of meat. The extensive menu features Wagyu, Black Angus and our very own Atlantis Certified Cattle, all prepared to order on a custom wood burning grill. The walk in wine cellar houses a collection of over 3500 bottles and adds an extra demension to the dining experience. Hakkasan at Atlantis, The Palm incorporates a restaurant and bar, segregated by intricate carved wooden screens and latticing that echo the rich and glamorous interiors of the London flagship restaurant. Calmness, tranquility and humility are translated into an elegant atmosphere true to Hakkasan’s Chinese roots. Experience an entirely unique and enticing dining experience with a menu that has been awarded multiple Michelin stars at locations throughout the world. The menu is a modern interpretation of authentic Cantonese cuisine, using the finest ingredients and expert techniques to create timeless yet innovative signature dishes. Our guest dine in sophisticated style at Ossiano and experience contemporary gastronomic cuisine which includes small plates and Caviar at the bar. Stunning Views of the Ambassador lagoon provide a unique and breathtaking backdrop that makes every occasion special. Chef Nobu Matsuhisa is renowed for modern, inventive cuisine that blends traditional Japanese dishes with South American ingredients. This sleek modern restaurant infused with Japanese style is a lively meeting place at the heart of the resort. All the changes are applicable to All bookings however, should there be any queries or concerns, please let us know and we will manage accordingly. Opening of Hakkasan Restaurant on the 15th October 2018. Additional AED 5 supplement charge per adult and AED 2.5 per child ( 4 to 11 years) at Ronda Locatelli and Bread street Kitchen.